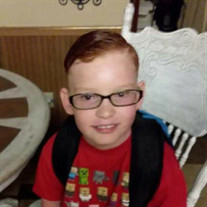 Dewayne Marshall Keene, age 8, of Ft. White, Florida, passed away on November 20, 2018, at UF Health Shands Hospital in Gainesville, Florida, from injuries he suffered in an automobile accident. He was born on January 19, 2010, in Lake City, Florida, to Samantha Parrish Warner. Dewayne was full of life and never met a stranger. He had the biggest heart and would do anything to help others. He loved kicking his soccer ball, watching football, especially the Florida Gators, and animals. He had a pet turtle, Michelangelo, a dog, Roxie, and a pet cat, Mr. Jenkins. He was a little brother and loved aggravating his older brother, Jonathen. He loved playing games like Yahtzee and cards and he loved to read. Spiderman was his favorite action hero. He had a huge personality and was a true hero. He will be deeply missed. He is preceded in death by his grandfather, Charles Parrish. Dewayne is survived by his mother, Samantha Warner of Ft. White, FL; step father, Jimmy Barrett of McAlpin, FL; brother, Jonathen Warner of Ft. White, FL; siblings, Kaitlyn and Chase Calhoun of Abbyville, GA; special cousin, George Chadwick of Ft. White, FL; step sisters that were very special to him, Ashley, Zoie, and Marcie Barrett of McAlpin, FL; grandmother, Nellie Kathleen Warfield of Cheifland, FL; great-grandmother, Naomi Grace Parrish of Ft. White, FL; aunt, Pamela Bonds of Lake City, FL; uncles, Terry Parrish and Curtis Melvin Parrish both of Ft. White, FL; and step grandparents, James and Sandra Barrett of McAlpin, FL. Dewayne has many extended family members and friends who also survive. A Celebration of Life will be held on Wednesday, November 28, 2018, at 2:00pm at the Watertown Congregational Methodist Church in Lake City, Florida. His family will receive friends for a visitation on Tuesday, November 27, from 6:00 to 8:00pm at the Archer Funeral Home Memorial Chapel in Lake Butler, Florida. Brother Randy Ogburn, Pastor, will be officiating services. Interment will follow at Elzey Chapel Cemetery in Lake Butler, FL. Arrangements are under the direction and care of Archer Funeral Home in Lake Butler. In lieu of flowers, the family requests donations, in Dewayne's memory, be made to either Autism Speaks or Mother's Against Drunk Driving.